This week many of our activities have been around the theme of Chinese New Year. In literacy we looked at the story of the Jade Emperor and how each year in the Chinese New Year is named after an animal. The children really enjoyed the story and had fun making rhyming strings based on the animals as well as writing the story independently during child initiated activity time. In numeracy our number of the week was 14 and we also looked at ordinal numbers, sequencing the animals from the Chinese New Year story in sequence. The Tigers enjoyed trying a range of Chinese food on Thursday and there wasn't a crumb remaining by the end of the afternoon! 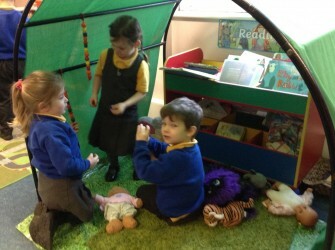 The children were able to talk about the things they liked and didn't and even had a go with chopsticks. On Monday we really enjoyed our usual Forest School session despite the wet and wild conditions! Please take a look at our photos to see some of the other fun things that we have been up to!